TrustBearer and David Corcoranwork+1-260-399-1648david.corcoran@trustbearer.com are doing cool stuff for years. Now they have been selected by Microsoft as one of two secure openid providers for HealthVault! Interesting that Sean Nolan, chief architect of Microsoft’s HealthVault service, says that they are working to support Information Cards in HealthVault too! Now let's put that on the patient's mobile phone. It appears that the official identity data of many Germans was online readable for over three month... including religion and sometimes a photo. How did this happen? Well, a software company that had successfully sold its eGovernment software to many German communities published the username and password of a demo version of their software on the internet. BUT this username and password happened to be the preinstalled standard username and password of the real application too. Ouch! I don't blame the administrators alone. Sure they probably violated the security policy of their organization but the bad security design of the application takes at least a quarter of the blame. Wait, let's put some blame on the German electronic signature laws too. The system of electronic signatures is so secure and expensive that nobody is willing to pay the price in Euros for it; not even or especially not the community and the government that made the laws. This would not have happened had they used Information Cards. Well, on the other hand it is not so complicated to use Information Cards in a way that is really stupid e.g. 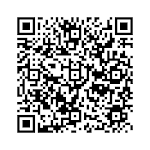 let anybody access the sensible data who presents a security token with the claim emailaddress == geheim@city.bund.de. 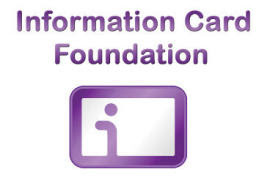 The Information Card Foundation was officially launched today. Great. The first press articles are on CNET and in the New York Times. I don't like the NYT's analogy of an "online ID card" that much... Information Cards let the user choose which ID she wants to use and from which identity provider it should be asserted. The ID might even be self-issued. There is no government asserted ID required. June 24, 2008 – Australia, Canada, France, Germany, India, Sri Lanka, United Kingdom, United States – An array of prominent names in the high-technology community today announced the formation of a non-profit foundation, The Information Card Foundation, to advance a simpler, more secure and more open digital identity on the Internet, increasing user control over their personal information while enabling mutually beneficial digital relationships between people and businesses. Information Cards take a familiar off-line consumer behavior – using a card to prove identity and provide information – and bring it to the online world. 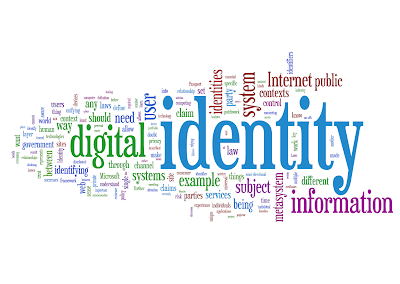 Information Cards are a visual representation of a personal digital identity which can be shared with online entities. Consumers are able to manage the information in their cards, have multiple cards with different levels of detail, and easily select the card they want to use for any given interaction. The founding members of the Information Card Foundation represent a wide range of technology, data, and consumer companies. Equifax, Google, Microsoft, Novell, Oracle, and PayPal, are founding members of the Information Card Foundation Board of Directors. Individuals also serving on the board include ICF Chairman Paul Trevithick of Parity, Patrick Harding of Ping Identity, Mary Ruddy of Meristic, Ben Laurie, Andrew Hodgkinson of Novell, Drummond Reed, Pamela Dingle of the Pamela Project, Axel Nennker, and Kim Cameron of Microsoft. Additional founding members are Arcot Systems, Aristotle, A.T.E. Software, BackgroundChecks.com, CORISECIO, FuGen Solutions, the Fraunhofer Institute, Fun Communications, the Liberty Alliance, Gemalto, IDology, IPcommerce, ooTao, Parity, Ping Identity, Privo, Wave Systems, and WSO2. Further information about the Information Card Foundation can be found at www.informationcard.net. Having Information Cards stored on limited capability devices (USB Tokens, SIM cards, UICC cards etc) currently is a difficult because many of the more secure devices have very little memory. People who have openend a crd file with an text editor or looked at a card in RoamingInformationCard format might have noticed that most of the space needed is due to the card image. I suggest that we change the Information Card format and introduce a new element that is a reference to the actual image. <ic:CardImage MimeType=”xs:string”> xs:base64Binary </ic:CardImage> ? <ic:RequireAppliesTo ...> ... </ic:RequireAppliesTo> ? The id selector can now choose the "right" image for the mobile device based on the image size, but more importantly it can now cache images in the case when more then one card has the same image (URL and hash) or the image was downloaded before. The hash is a protection against DNS spoofing. Alternatively we could define that the href must use SSL and use the id selectors certificate based protection mechanisms against attacks. 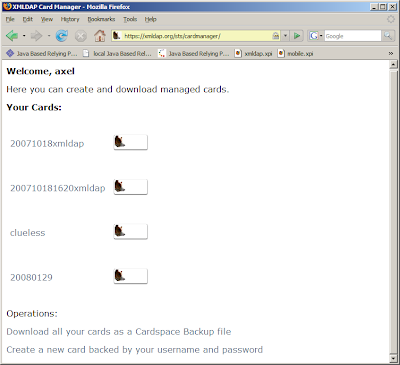 I changed the openinfocard id selector and the xmldap idp to make it easier to install managed cards. Let's say you visit the IdP of your trust and have logged into its service using username and password. In fact the choice of this authentication might influence the rest of this scenario. Formerly you were presented with a list of links that you could click and you had to save the .crd file to disk, then open the id selector of your choice to import the card. 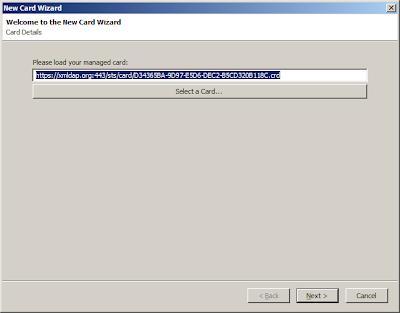 The new card wizard of the openinfocard id selector has opened and the card is retrieved from the URL that was delivered to the id selector. Well, how does this work?! I use a special tokentype "urn:oasis:names:tc:IC:1.0:managedcard" that tells the openinfocard id selector to use the value of the "issuer" parameter to retrieve and import the card. There might be better ways to do it and there is a precondition here that I did not mention. Do you see it? Back to the IdP authentication... Instead of username and password an IdP might have allowed authentication with a self-issued card and then that card could be used for authentication when the managed card is used to provide claims to a relying party! This happens together with the workshop "Adopting SOA for Telecom". Sounds interesting, I would like to attend. Gerry Gebel is giving the keynote and Anthony Nadalindrsecure@us.ibm.com is on the workshop committee. I am missing a gene that makes that I don't understand usage guidelines and IPR discussions. Today I updated the xmldap relyingparty to contain two HTML objects of type "application/x-informationcard". To keep things simple I just have put two forms on the website each containing one object. The only difference between the two is that on requires a self-issued card while the other does not restrict the issuer. The id selectors seem to handle this well. I tested it with the openinfocard id selector and with CardSpace. 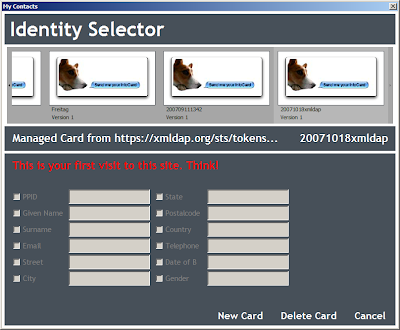 The openinfocard id selector has its flaws too but they don't stop this test from "working" or do they? This table is not usefull to conclude the maturity of the Identity Metasystem from it. Shame on us. Shame on me. Today I began to put Microformats in my blog and installed the operator extension into Firefox to see and work with microformats. I was astonished that blogger has put a little bit of microformat into my blog already. Using operator or a similar tool you can now work on the tags, export events and contact information. This is a nice start. Next I want services specifications; either XRDS (simple) or Microsoft's openservices?! Please notice the green cross and the new "operator" toolbar.